April 10, 2019, Athens Banner Herald. “New book details nature and history along the Oconee River corridor” by Wayne Ford. July 30, 2018 – WTOC “Flint Riverkeeper Meetings Begin Today” by Dave Miller. October 3, 2018 – The Moultrie Observer, “Paddle Georgia to Cross Florida Line”. March 28, 2017. AJC Metro Newspaper- “Teachers have a chance to join weeklong adventure on river”. By: Staff. October 6, 2017. WALB News 10- “‘Fall Float’ begins on the Flint”. February 17, 2016 – CBS46.com, “Jackson Lake popular destination for Atlanta trash, litter” by Dante Renzulli. 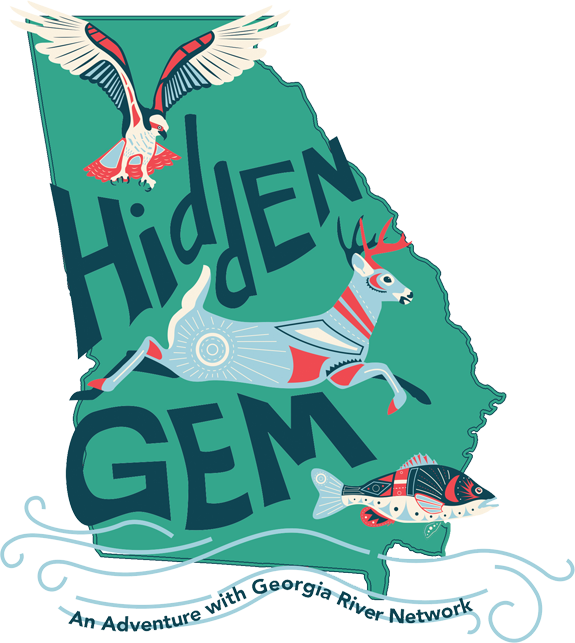 March 7, 2016 – Georgia River Network Weblog, “Seeing Something You’ve Never Seen Before on the Conasauga” by Georgia River Network. HYPERLINK “https://garivernetwork.wordpress.com/2016/03/07/seeing-something-youve-never-seen-before-on-the-conasauga/” \\t “_blank” https://garivernetwork.wordpress.com/2016/03/07/seeing-something-youve-never-seen-before-on-the-conasauga/. May 23, 2016 – MyInforms.com, “BUZZ: BIG SATURDAY BREWING IN DOWNTOWN ROME. PADDLE GEORGIA SAILS INTO CALHOUN JUNE 22. AN OLYMPIC MEMORY. By: Jack Druckenmiller. HYPERLINK “http://johndruckenmiller.com/blog/2016/05/20/buzz-big-saturday-brewing-in-downtown-rome-paddle-georgia-sails-into-calhoun-june-22-an-olympic-memory/” http://johndruckenmiller.com/blog/2016/05/20/buzz-big-saturday-brewing-in-downtown-rome-paddle-georgia-sails-into-calhoun-june-22-an-olympic-memory/ HYPERLINK “http://myinforms.com/en-us/a/34053762-buzz-big-saturday-brewing-in-downtown-rome-paddle-georgia-sails-into-calhoun-june-22-an-olympic-memory/” http://myinforms.com/en-us/a/34053762-buzz-big-saturday-brewing-in-downtown-rome-paddle-georgia-sails-into-calhoun-june-22-an-olympic-memory/ May 25, 2016 – Oconee County Observations, “Oconee County expecting report in June evaluating options for discharge from calls creek plant” by Lee Becker. June 3, 2016 – Online Athens, “Boat ramp at Athens’ Ben Burton Park will be part of the “Blue Trail” one day.” By Lee Shearer. HYPERLINK “http://onlineathens.com/mobile/2016-06-03/boat-ramp-athens-ben-burton-park-will-be-part-blue-trail-one-day” http://onlineathens.com/mobile/2016-06-03/boat-ramp-athens-ben-burton-park-will-be-part-blue-trail-one-day. Satilla Riverkeeper Spring 2016 Newsletter, “Spring on the Satilla Huge Success” by Mary Freund. June 9, 2016 – The Union-Recorder, “Milledgeville woman to embark on 103-mile kayak.” HYPERLINK “http://www.unionrecorder.com/news/milledgeville-woman-to-embark-on–mile-kayak/article_419a3494-2e5e-11e6-a50e-9f02f96b5972.html” http://www.unionrecorder.com/news/milledgeville-woman-to-embark-on–mile-kayak/article_419a3494-2e5e-11e6-a50e-9f02f96b5972.html. June 13, 2016 – Hometown Headlines, “Paddle Georgia, 400-plus strong, beings trek from Whitfield to Rome’s Heritage Park on Saturday.” HYPERLINK “http://johndruckenmiller.com/blog/2016/06/13/paddle-georgia-400-plus-strong-begins-trek-from-whitfield-to-romes-heritage-park-on-saturday/” http://johndruckenmiller.com/blog/2016/06/13/paddle-georgia-400-plus-strong-begins-trek-from-whitfield-to-romes-heritage-park-on-saturday/. June 15, 2016 – Albany Herald, “Georgia River Network’s Paddle Georgia 2016 to begin this weekend” by staff reports. HYPERLINK “http://www.albanyherald.com/news/local/georgia-river-network-s-paddle-georgia-to-begin-this-weekend/article_31ccb85f-9a68-584b-807e-1b43e2235a59.html” http://www.albanyherald.com/news/local/georgia-river-network-s-paddle-georgia-to-begin-this-weekend/article_31ccb85f-9a68-584b-807e-1b43e2235a59.html. June 18, 2016 – Rome News-Tribune, “Paddle Georgia begins today, ends in Rome on June 24,” by Joe Cook. HYPERLINK “http://www.northwestgeorgianews.com/rome/news/local/paddle-georgia-begins-today-ends-in-rome-on-june/article_c3862f4c-350e-11e6-b835-7bc52cd2ca44.html” http://www.northwestgeorgianews.com/rome/news/local/paddle-georgia-begins-today-ends-in-rome-on-june/article_c3862f4c-350e-11e6-b835-7bc52cd2ca44.html. June 19, 2016 – Hometown Headlines, “This week: government meetings, baseball, and Paddle Georgia with street party in Calhoun, Journey’s End celebration in Rome,” by hometownheadlines. HYPERLINK “http://johndruckenmiller.com/blog/2016/06/19/this-week-government-meetings-baseball-and-paddle-georgia-with-street-party-in-calhoun-journeys-end-celebration-in-rome/” http://johndruckenmiller.com/blog/2016/06/19/this-week-government-meetings-baseball-and-paddle-georgia-with-street-party-in-calhoun-journeys-end-celebration-in-rome/. June 20, 2016 – WRGA, “Paddle Georgia continues this week,” by staff reports. HYPERLINK “http://wrganews.com/common/page.php?feed=1&id=78981&is_corp=1” http://wrganews.com/common/page.php?feed=1&id=78981&is_corp=1. June 21, 2016 – Rome News-Tribune, “Paddle Georgia pulls 800 pounds of trash from river, has 13-mile trek to Calhoun today,” by Ramsey Cook. HYPERLINK “http://www.northwestgeorgianews.com/rome/news/local/paddle-georgia-pulls-pounds-of-trash-from-river-has-/article_062d4b6a-3761-11e6-a7bb-63ea992950c1.html” http://www.northwestgeorgianews.com/rome/news/local/paddle-georgia-pulls-pounds-of-trash-from-river-has-/article_062d4b6a-3761-11e6-a7bb-63ea992950c1.html. June 22, 2016 – Hometown Headlines, “Outdoors: Paddle Georgia brings river party to downtown Calhoun tonight,” by hometownheadlines. June 22, 2016 – The Daily Citizen, “Not just a good ride” HYPERLINK “http://www.daltondailycitizen.com/opinion/not-just-a-good-ride/article_e8d36bde-38e2-11e6-b8bb-47b63e1c3cb7.html” http://www.daltondailycitizen.com/opinion/not-just-a-good-ride/article_e8d36bde-38e2-11e6-b8bb-47b63e1c3cb7.html. June 22, 2016 – Gainesville Times, “508-acre waterfront development near Braselton gets planners’ OK,” by Jeff Gill. June 23, 2016 – Rome News-Tribune, “Paddle Georgia in Calhoun” HYPERLINK “http://www.northwestgeorgianews.com/rome/news/local/paddle-georgia-continues-in-calhoun/article_fba4277a-38fc-11e6-bfad-8bb21be22f79.html” http://www.northwestgeorgianews.com/rome/news/local/paddle-georgia-continues-in-calhoun/article_fba4277a-38fc-11e6-bfad-8bb21be22f79.html. June 23, 2016 – Hometown Headlines, “Outdoors: Paddle Georgia party at Heritage Park later today. Plus: Watch arrival from Off Broad, River Dog,” by hometownheadlines. HYPERLINK “http://johndruckenmiller.com/blog/2016/06/23/outdoors-paddle-georgia-flotilla-continues-103-mile-journey-to-rome-photos-calendar-additional-coverage/” http://johndruckenmiller.com/blog/2016/06/23/outdoors-paddle-georgia-flotilla-continues-103-mile-journey-to-rome-photos-calendar-additional-coverage/. June 30, 2016 – Lake Lanier, “Register now for the Fall Float on the Flint,” by Robert Sutherland. HYPERLINK “http://lakelanier.com/2016/06/register-now-fall-float-flint/” http://lakelanier.com/2016/06/register-now-fall-float-flint/. June 30, 2016 – The Citizen, “GRN plans Float on the Flint.” HYPERLINK “http://thecitizen.com/community/grn-plans-float-flint” http://thecitizen.com/community/grn-plans-float-flint. July 3, 2016 – Forsyth County News, “Hundreds take part in 103-mile Paddle Georgia trip,” by Jennifer Linn. HYPERLINK “http://www.forsythnews.com/section/1/article/30474/” http://www.forsythnews.com/section/1/article/30474/. July 6, 2016 – Albany Herald, “Registration open for 56-mile Fall Float on the Flint,” by Jennifer Parks. HYPERLINK “http://www.albanyherald.com/news/local/registration-open-for–mile-fall-float-on-the-flint/article_313197ba-5ca2-57b8-ba2f-3e76a544d68a.html” http://www.albanyherald.com/news/local/registration-open-for–mile-fall-float-on-the-flint/article_313197ba-5ca2-57b8-ba2f-3e76a544d68a.html. August 27, 2016 – Cherokee Tribune Ledger News, “Fun flows on the Etowah river” by HYPERLINK “http://www.tribuneledgernews.com/local_news/fun-flows-on-the-etowah-river/article_af50ffac-6bf0-11e6-ac2d-a7186a4b4691.html” http://www.tribuneledgernews.com/local_news/fun-flows-on-the-etowah-river/article_af50ffac-6bf0-11e6-ac2d-a7186a4b4691.html by ?. September 8, 2016 – The McDuffie Progress, “Development of Little River water trail begins” by Caitlin Boland. HYPERLINK “http://www.mcduffieprogress.com/article_7592.shtml” http://www.mcduffieprogress.com/article_7592.shtml September 9, 2016 – AJC, “Georgia ratchets up drought alert” by Dan Chapman. June 18, 2015 – The EarthShare of Ga Daily, “Buff Battles: Past, Present and Future?” – Chris’s gawaterwire blog was highlighted in Earthshare’s email. June 30, 2015 – Savannah Morning News, “Rules over lawn watering, car washing during next drought are approved” by Walter Jones. September 10, 2015 -The Covington News, “Making Porterdale a destination for visitors” by Sandra Brands. September 14, 2015 – The Citizen, “Locals to tackles Flint River” by Staff. October 2, 2015 – SavannahNow, “Anti-Pipeline Group Honored” by Mary Landers. November 23, 2015 – AJC, “Years later, Georgia governor’s water program still far from goal” by Greg Bluestein. HYPERLINK “http://www.myajc.com/news/news/state-regional-govt-politics/years-later-georgia-governors-water-program-still-/npRrT/” http://www.myajc.com/news/news/state-regional-govt-politics/years-later-georgia-governors-water-program-still-/npRrT/ . December 4, 2015 – The Broad Collective, “Georgia River Network” by Dana Skelton.